As libraries make their public­-facing spaces more people-­focused and mobile tech makes big us/them service desks obsolete, it’s important to ensure that staff have creativity­-enhancing spaces of their own along with the work processes, tools, and training to be effective. Libraries everywhere are making great strides on behalf of their users. They are developing inspiring and flexible spaces, offering innovative services and programs, and providing learning opportunities that help people, ideas, and businesses grow. None of this is possible without engaged, effective staff, yet their space needs are often overlooked. Like patrons, library staff, too, need great environments in which to do their work. They also require services that are co-designed with them to meet users’ and staff needs simultaneously and organizational development and training programs that enable them to take on new roles, work in new ways, and continuously adapt and improve. COLLABORATE & LISTEN Staff, like patrons, need flexible spaces in which to work together, as illustrated by NCSU’s Hunt Library. Ensuring that libraries are also great places for staff to work in begins with understanding how libraries are changing to address new user needs. Libraries have been expanding their mission to support creativity further with Maker spaces and events, foster community and connections among users, and collaborate with other organizations to provide core services and complementary ones. A small-­scale example is Oakland Public Library’s Tool Lending Library. A large­-scale example is New York City’s idNYC program, which developed a kind of membership ID card that is obtained at public libraries and other locations and grants access to cultural institutions and social services citywide through a partnership with New York City government and 33 cultural institutions across the five boroughs. These changes inevitably prompt the rethinking of library spaces as well as the services offered in them, often exemplified in new approaches to physical service desks. Staff now rove throughout spaces, and the large barrier desks between users and staff have been shrunk and repurposed into centralized one­-stop shops for previously distributed places to get specialized help. Case in point, the new library at Liberty University, VA, created a customer service center that provides integrated services, with staff working at more approachable podia. Supervisors and experts are nearby to supply more advanced assistance. This also is fueled by thinking about digital services and physical spaces in a coordinated way; for instance, using digital tools to help make the experience in the space better through self­-service; online reservation of books, technology, rooms, and consultations; discovery of what’s happening when; and improved navigation and way-finding via mobile devices, signage, and, soon, location­-aware technology like iBeacons. There is also a long history of research in the hospitality industry that shows that customer satisfaction is correlated to employee satisfaction, for both frontline staff and those behind the scenes who don’t interact with customers directly. More broadly, the Gallup organization’s 2012 Meta Analysis of 263 research studies using its 12 question survey on employee engagement (“the Q12”) in 192 organizations within 49 industries across 34 countries revealed, “Work units in the top quartile in employee engagement outperformed bottom quartile units by 10% on customer ratings, 22% in profitability, and 21% in productivity.” The workplace plays an important role in employee engagement not only by supporting day­-to-­day activities but also by enabling social connections among employees and conveying the image of the organization and its mission and purpose. Employing human­-centered design principles and service design tools is a great way to start aligning user and staff needs. This means using the same tools to research user and staff needs as well as create solutions to address them. As part of Georgia Tech’s library renewal, brightspot worked with a staff task-force to interview users; create hypothetical portraits of archetypal users and staff in terms of their motivations, behaviors, and expectations; develop journey maps that identify the different “touchpoints” by which people interact with information, space, technology, and one another; and devise service blueprints for new and enhanced services that coordinate users’ action, frontline staff, behind­-the-­scenes workers, and needed infrastructure. Everyone gained an understanding of tools to apply elsewhere but also insights into one another’s experiences and needs; for example, staff learned about traits such as cultivating relationships and actions like showcasing that were common across different roles, departments, and levels within the organization. New services can also be piloted, and prototyped even before that using mock­ups and role-­play to test ideas and build empathy among users and staff. Using the same tools for users and staff—and doing so in a participatory process—is a crucial way to ensure that staff needs are addressed, to build in staff ownership over changes in how they work, and to position staff best to implement service changes such as supporting new activities like MOOC (massive open online course) study groups or convening hackathons in makerspaces. 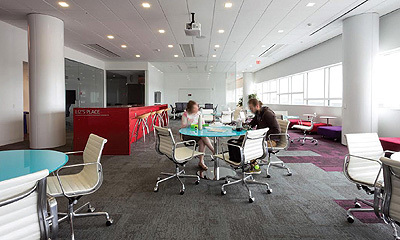 The staff workplace within North Carolina State University’s Hunt Library is one notable exception. There, a strong commitment has been made to collocate and then mix staff (rather than distribute different groups or departments throughout the library) as well as to support collaboration with a hub of shared informal work spaces, inspired by tours of Google’s offices. The Inquiry Labs in UCLA’s Powell Library is another interesting model in which user and staff space blend and overlap within one large space. The area brings together a “living room” used for staff meetings and classes; open consult areas with large­screen staff workstations in an open plan and adjacent meeting spaces. With this information—often called “workstyles”—in hand, the workplace can be created or adapted to include a variety of different settings to support different kinds of work and a variety of ways of working, including both concentration and collaboration in addition to the ability to transition easily between the two. This could include assigned and/or shared desks, meeting spaces of varying sizes and atmospheres, phone rooms, booths, quiet areas, consultation spaces, and informal communal space, to name a few. These spaces need to be allocated with the right proportion of individual to collaborative space—likely something like 65%–75% individual to 25%–35% collaborative. Like a great city, space needs to transition from lively to quiet and be organized into “neighborhoods” that have a human scale (for 25 to 40 people) and bring diverse spaces into proximity. The spaces will also require furniture that accommodates contrasting ergonomic and functional needs, such as desks that enable side­by­side collaboration and will need technology that enables mobility and productively such as laptops and larger/additional screens. Also, because space communicates values, it should also express the mission and brand of the organization. PARTICIPATORY PLANNING Using human-centered design not only yields more viable workplaces, it helps staff gain insight into one another’s needs and learn to use the tools for future projects. Elliot Felix is founder of brightspot, a strategy consultancy that helps university, cultural, and Fortune 500 clients rethink their space, reinvent their service offerings, and redesign their organization to improve the experiences of their customers and staff. This article originally appeared in the Spring 2015 issue of Library by Design.